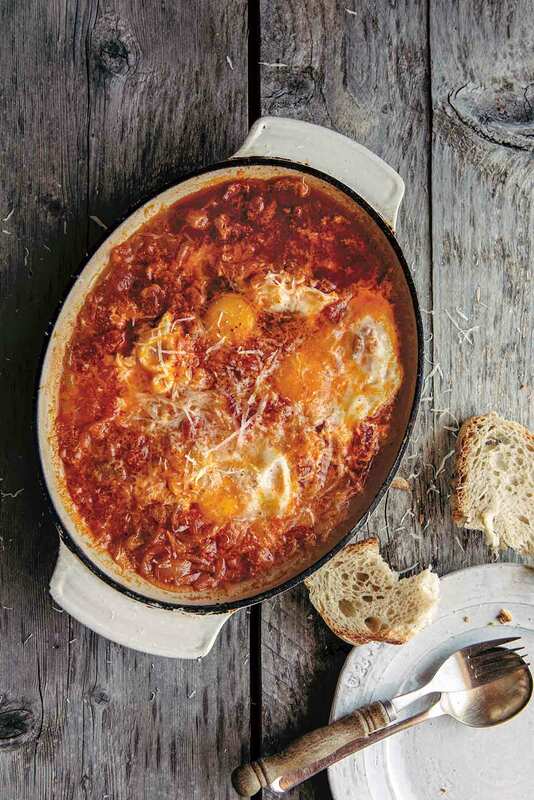 Acquacotta, an Italian bread soup from Maremma in southern Tuscany, is simply Shakshuka with an Italian accent. Stale bread, cooked onions, and chiles are stewed with tomatoes. On top are perched poached eggs and Parmesan cheese. 1. If you’re using fresh tomatoes: Set a medium pot filled with water over high heat, and bring to a boil. Fill a medium bowl halfway with ice water. Using the tip of a sharp knife, make a small cross on the bottom of the ripe tomatoes. Plunge the tomatoes into the boiling water for about 30 seconds. Using a slotted spoon or tongs, remove the tomatoes and plunge them into a bowl of ice-cold water until cool enough to handle. The tomato skins should be very easy to slip off. Chop the tomatoes into quarters and remove the watery seeds. Toss the seeds and skins into the compost. Chop the rest of the tomatoes into dice and set aside. If you’re using canned tomatoes, dump them in a large bowl and use your hands, a wooden spoon, or a potato masher to break them up. 2. In a large, heavy pot or Dutch oven set over low heat, warm the oil. Add the onions and celery along with a good pinch of salt and cook, stirring occasionally, until the vegetables soften, 15 to 20 minutes. 3. Increase the heat to medium, add the white wine, and simmer until slightly reduced, 3 to 4 minutes. 4. Stir in the tomatoes. Add another pinch of salt and the chile, if using. Pour in half the stock or water and bring to a simmer, then turn the heat down to low and let it cook gently slowly, uncovered, for about 45 minutes, stirring occasionally. The liquid should reduce to a nice, rather thick consistency, but there should still be enough liquid to be able to poach the eggs in it. If necessary, top with the rest of the stock or water. Taste for seasoning and, if necessary, add salt or pepper. If a smoother consistency is desired, you can use an immersion blender to gently puree it a little. 5. Crack 1 egg into a small bowl. Use the back of a spoon to make a small indentation in the onions and tomatoes, bring the bowl close to the surface of the simmering sauce, and carefully tip the egg into the well. Repeat with the remaining eggs, being careful not to situate the eggs too close together. Poach the eggs until the whites are cooked but the yolks are still soft and runny, 4 to 6 minutes. (Or, if you prefer your egg yolks firm, spoon some sauce over the top of the yolks.) You may need to increase the heat ever so slightly to keep the sauce gently simmering. When the eggs are done to your liking, remove the pot from the heat. 6. Place a slice of bread at the bottom of each bowl. With a ladle, carefully scoop out the poached eggs one by one and place each on a slice of bread. Scoop out more sauce and ladle it around the egg. The bread will soak up any excess liquid. Sprinkle each dish with grated cheese and let it sit for a minute or two before serving. Acquacotta Recipe © 2017 Emiko Davies. Photo © 2017 Lauren Bamford. All rights reserved. All recipes and photos used with permission of the publisher. This acquacotta is a sturdy yet simple peasant food one-dish dinner (or lunch or breakfast, really), this can be made ahead up to a point, and in fact that is exactly what I would recommend. By making the sauce ahead of time the flavors develop nicely sitting overnight then reheating. Since there were just 2 of us, we tried it both right away and the second day, which allowed me to play with the proportion of onions to tomatoes. Overall I would either increase the tomatoes or reduce the onions (and one way to reduce the onions would be to cook them much longer, til they go golden brown but short of caramelization). The poaching of an egg in the soup broth is a favorite method—it does indeed produce perfect fluffy clouds of egg white and my local eggs with huge golden yolks were standouts. I will definitely make this again, and trust my instincts on the ratio of tomato to onion. This is a judgement call you will need to make based on how ripe and flavorful the tomatoes are. If you are using fresh tomatoes, strain the tomato water from the seeds you remove, and make that part of your broth, grabbing every chance to enhance the flavor. Use your largest wide-bottomed pan (a flat bottom enameled Dutch oven works better than a rounded corner one). If you use the full complement of onions, initially that is an alarming amount, but they do reduce by more than half in the time it takes to soften them, which you help by turning over the sliced onions and distributing the olive oil and the heat every so often. This was delicious, though a bit too onion-ish with the maximum amount of onions. I think just adjusting the onions or cooking them longer (and in the biggest dutch oven you have), make the difference for this to be a successful recipe. I am excessively fond of the addition of an egg to poach in chile, pozole or hearty soups, and want this to delight. I will be adding this acquacotta to my list of easy comfort food. I loved the simplicity of the fresh-tasting soup. The sweet and tender onions play a major role in the overall flavor—the dish surprisingly benefits from the absence of garlic or herbs, allowing the delicate creamy eggs to come through. Paired with rustic bread, it is satisfying without being heavy. My ciabatta bread was pretty fresh, so I put the slices in my toaster and set it at the lowest setting (the bread didn’t brown at all; it just got a little dry, just like stale bread). The bottom of the yolks were more cooked than the top from the heat of the soup. Next time I’ll cover the pot so that the eggs will poach faster and more evenly. One of the best ways to really get to know the cuisine of a region is to spend time making their most rustic recipes. These recipes, no matter the country, have stood the test of time, are usually made with simple, quality ingredients and are oh-so-comforting. 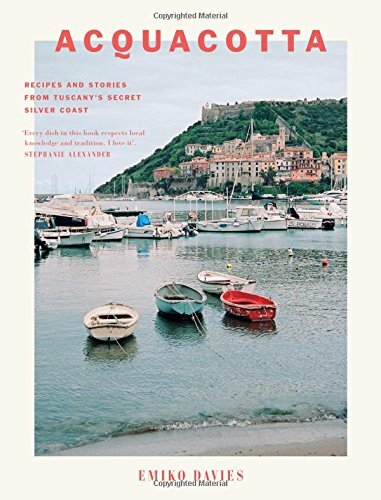 This Tuscan recipe for a simple acquacotta--tomato ragout served over stale bread with poached eggs and a sprinkling of cheese--is just that...and more. After you make a recipe like this, you can understand the mind of being in an Italian kitchen: use what ingredients that you have on hand, waste nothing, and the idea that simplicity is best. We really enjoyed this dish because of its simple flavors and rusticity. I was drawn to this recipe not only because I love anything tomato-y but also because I had all of the ingredients already either in my pantry or in the fridge. I had bought a nice Tuscan boule earlier in the week, which was the perfect bread to use here; I also had a 28-ounce can of whole, peeled tomatoes in the pantry and a box of organic vegetable stock as well; and my favorite cheese, Pecorino Romano, is always in the fridge. Duck eggs work very well in this dish if you have them for their extra-large size. I kept the pairings for this meal simple as well: a glass of Chianti and pan-seared fish fillets flavored with a touch of olive tapenade served over peppery greens. The only other thing I would recommend sprinkling on top besides the cheese would be some freshly chopped basil. This acquacotta is definitely a winner in my book. Simple to prepare using ingredients that most cooks will have on hand and easy to alter or add to based on taste and preference, it will gain a place in my binder of go-to weeknight recipes. I have to add that my family gave it a unanimous thumbs up—and that includes a 14- and 15-year-old who are very tough critics. I have seen other versions of this recipe, but what makes this one unique is that it relies on a large quantity of onions to flavor the stew. The onions break down slightly and offset the acid from the tomatoes. The poached eggs are the wow factor. When the yolks are broken and run into the stew, it creates a wonderfully rich, creamy experience. The prep time was minimal. Using a mandoline made short work of slicing the onions. I utilized canned whole tomatoes that I had in the pantry, first pouring them into a bowl and then crushing them with my hands before adding them to the pot (this is a great way to break them up and it’s oh so satisfying). When I make this recipe again, I will add another couple of eggs. I found that I had a lot of onion and tomato mixture left over after serving my family of four. One family member suggested adding some Italian sausage to the stew would be tasty. I finished the dish with the Parmesan and a sprinkle of fresh herbs. One of my late mother's favorite breakfast was a tomato and egg sandwich. Thus, this acquacotta has been dubbed ""breakfast soup"" during the working trials in my kitchen. In the end my mother decided that there was no harm in eating bacon when you're 90, and I decided that although this made a perfectly good soup, it too might have enjoyed a little bacon. But then I have a friend who tells me everything goes better with bacon. She happens to be a vegetarian. This was mildly flavored even with the addition of red pepper flakes. With the eggs added in and the pepper flakes left out, it would be good as both comfort food and a suitable meal for an invalid. Timing notes: It took closer to 20 minutes for my vegetables to become soft. It was also 4 1/2 to 5 minutes for all the added eggs to poach. Wine was reduced in the 4 minutes allotted. I did not need to add water at any step so the original 2 cups of vegetable stock was sufficient. Total time was 1 1/2 hours with about 45 minutes being hands on. Ingredient notes: I used fresh tomatoes. The peeling method provided was the same as I learned from my grandmother years ago. I derived some comfort from learning that Lithuanian grandmothers and Italian grandmothers peel their tomatoes the same way. My celery half stalk weighed 1 1/8 ounces or 33 grams. I used chili flakes, Pinot Grigio, Morton's iodized table salt and large eggs. I also sprinkled Parmesan cheese on top. The second time around I did add some bacon just because for some reason I had leftover bacon. I had never heard of acquacotta before but the simplicity attracted me to it. I love using soup as a way to make the house smell delicious for hours. As I started reaching the end of the recipe, I was worried the soup would be too simple—it was essentially just tomato and onion soup. But that poached egg completely changed it—the yolk made the mouthfeel creamy and satisfying. To reheat leftovers, I put a serving of soup in a small pot on the stove, got it simmering, and poached another egg in it. For me, this soup was still missing something. I would want to add a can of chickpeas or a scoop of lentils or rice to it for more substance and body. During an unusually overcast rainy cold summer weekend, this was the perfect dish for a brunch with overnight guests. The simmering of the sauce gave a friend and I time to get in a quick morning walk before eating while the aroma of tomato and onions assured our spouses we would be eating something good. I found the directions for the recipe to be spot on. It would be a recipe to make if you are blessed with an abundance of tomatoes, although I used canned tomatoes and dried chili flakes with great success. I did not need to add additional water and found the wine reduced in the allotted time. Acquacotta. A very filling comfort food and you probably have everything in your pantry. There's plenty of room to customize this dish and we really loved the bread in the bottom of the bowl. The wine added a very nice touch! I couldn't get the poached egg to sit nicely on the bread. It fell to the side on each bowl! Next time, I would make a bed of onions on top of each bread and nest the poached egg into that and then pour more soup over. This dish really needed the Parmesan cheese to round out the flavors. I have to agree with my husband on this one and give it 2 thumbs up. The acquacotta was sweet and warm, rich and filling without being heavy. We both agreed that we'd love this on a cold winter night. Mixing the soft yolk with the broth added to the richness of the broth and the bread added a little soft texture and chew. I used fresh tomatoes and the skins slid off with no difficulty at all. I sliced the onions into thin rounds, but would also slice them crosswise next time to make the finished soup a little easier to spoon up. The rounds became long strings as they softened and cooked down.